Teaching Tree is a free resource for anyone who is interested in learning about computer science on his or her own. Teaching Tree offers videos organized into five categories with dozens of topics inside each category. The videos that you will find in Teaching Tree are a mix of short tutorials and longer lectures from university professors. The longer lectures are tagged with the key concepts that they contain. Clicking on a tag jumps you to the spot in the lecture that addresses the concept you want to learn about. 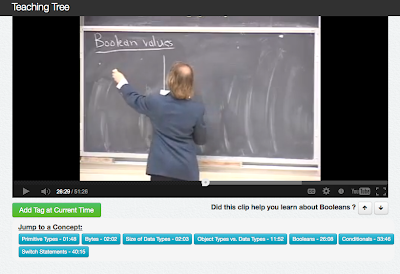 Registered Teaching Tree users can add videos and tag videos. Teaching Tree could be a great resource for students who want to learn about computer science on their own. If you teach computer science courses Teaching Tree could be useful for locating review materials to share with your students. You may also consider having your students search for or create videos to share on Teaching Tree and then tag them to help other people learn from their work.